The theme for Week 7 of the 2015 edition of the “52 Ancestors in 52 Weeks” challenge is “Love” and my choice is a relative, but not an ancestor – my great-aunt, Hilaury Bergmeister Thumann. Baptized Hilaria, she was called Hilaury, or Lari for short, and Laura once she moved to America. I had to depart from the direct line of ancestors for this one, because the theme asked “Which ancestor do you love to research? Which ancestor do you feel especially close to? Which ancestor seemed to have a lot of love?” The answer to all three of those questions is great-aunt Laura because she continues to surprise me, I’ve found ancestors and relatives directly as a result of researching her (as opposed to her brother, my direct ancestor), and I feel like we share some things in common. Much of Laura’s story might be familiar if you’re following along with these weekly posts – her brother, my great-grandfather Joseph Bergmeister, was profiled in Week 5. I’ve also written about Laura on the blog before, but since then I’ve discovered a few more things about my favorite great-aunt. Laura Bergmeister was born on 10 January 1870 in Asbach, Bavaria, Germany to Joseph Bergmeister and Ursula Dallmaier. She was born illegitimate, but her father was named in the baptismal document and the couple married the following year on 11 April 1871 in Pfaffenhofen an der Ilm. Joseph was a flour merchant, the son of a long line of millers in the town of Puch. Since Joseph was not the oldest son who would inherit the mill, he was a merchant of the mill’s goods. His children are born in various towns throughout Bavaria, so I assume he traveled from town to town selling flour. Ursula was the daughter of an innkeeper in the town of Asbach, and that is where Laura was born. In 1871 the family was living in Vohburg a.d. Donau when a daughter named Marie was born on 17 November, but the baby did not survive. In 1873, Joseph was born in Vohburg. In 1873, Ignatz was born in Abensberg. 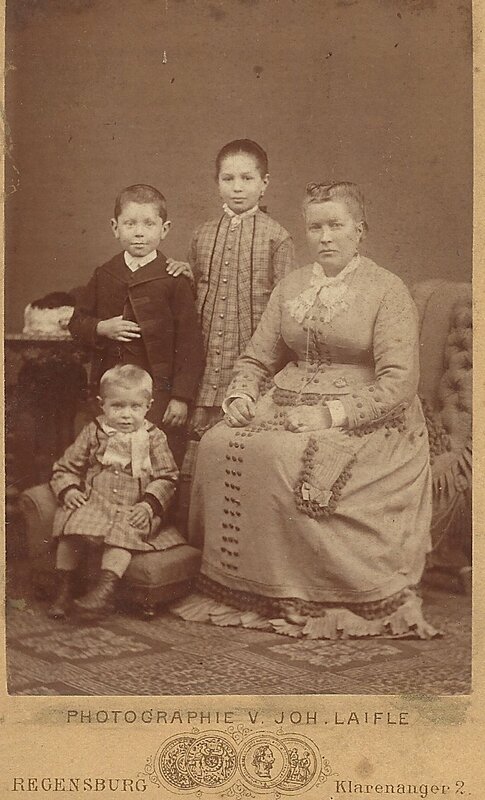 By 1879, the family appears to be living in Regensburg based on a photograph of Laura, her brothers, and their mother. Laura made her First Communion at the Dom St. Peter, the cathedral of Regensburg, in May, 1880. At some point during Laura’s childhood, her father died. I have yet to find out when, but it was sometime after the youngest son’s birth 1876 and 1884, because in May of 1885 his widow is remarried and having another child. By 1884, mother Ursula is married to Herman Goetz (Götz). The Bergmeister siblings gained half-brothers Herman in 1885 and Julius in 1886 as well as a half-sister Elsa (birth date not yet known). Often in discovering information about our ancestors and relatives through genealogical documents, we only uncover bare facts such as names or dates or places. However, I was given a couple of unique family heirlooms/ephemera that belonged to Laura that actually gave me some insight into her personality. One is an “autograph” book, also called a stammbuch or poesiealbum (poetry album). The concept began in Germany among university students – almost like a yearbook by today’s standards, minus photographs – in which students would have friends and professors write a page, usually a poem, to the owner. By the late 19th Century – when Laura was a girl – the books were popular among teenage girls. The very first entry in her book is signed by “father” on 24 October 1883 – I just can’t be certain (yet) that it is her father Joseph or instead her step-father Herman. The next page is signed by her mother, but not until 01 April 1884 and there are some entries later in the book that are dated in between those two. The book itself will result in a series of posts here once I get all of the entries translated, but in the ones I have so far it seems, based on the poems, that Laura had a cheerful spirit and spread that good cheer among others. She started this book when she was 13 years old and entries include her parents, brother(s), cousins, and girlfriends. She collects a few entries each year all the way until she’s almost 26 years old for a total of 35 pages of poems or notes. Incredibly, she even has a few entries from people she met on the ship to America! Sure enough, Wally, presumably short for Walburga, is listed on the passenger list immediately above Laura. She is 18 and listed as a servant. I found her in the 1900 census working as a maid in the household of a prominent Philadelphia lawyer. When I looked over the passenger list more closely, I noticed that there are several single woman aged 18 to 24 that are listed as “servant” – in Laura’s case, she is listed as “housekeeper”. Did they all come together for work? A couple of these young girls signed Laura’s autograph book on the way over, and there was even an entry from Louis Lester Rosenbaum who apparently was an engineer for Edison Electric Light. This tells me that young Laura wasn’t a shy girl if she has men signing her autograph book on board the ship! Laura (and Wally, for that matter) settled in Philadelphia. I don’t know anything about Laura’s life until three years later. On 15 June 1896, she married Max Thumann, a cabinetmaker originally from Regensburg, who was 13 years her senior. They come from the same city, but Max had been in the United States since 1883. If they knew each other in Germany, Laura would have only been 13 years old when he left! At the time of Laura and Max’s marriage, she lived at 2827 Reese Street in Philadelphia. By 1900, the couple was living at 1033 Jefferson Street and Hilaire’s occupation is listed as “retail grocery”. Interestingly, one of the witnesses to Max and Hilaire’s marriage, Michael Hoffbauer, is a grocer at Hilaire’s old Reese Street address, so it is presumed that she continued to work there. Max and Hilaire bought a house at 6078 Kingsessing Avenue in 1907, and they lived there until their deaths. Beginning in 1900, Max and Laura welcomed the arrival of the first of Laura’s brothers from Bavaria. When she left Germany, her Bergmeister brothers were 20 and 17, and her Goetz brothers were still children aged 8 and 7. I only recently found out about sister Elsa, presumable a half-sister, but I don’t know where she falls into the family. Despite their ages and the distance between them, communication must have continued through letters across the ocean. Because when each brother arrived in the US, their passenger list shows they were going to Hilaire and Max’s house and that the passage was paid for by their brother-in-law Max Thuman. Joseph was the first brother to join Laura in America, arriving in New York City in May, 1900. Max paid for his passage, and his sister is listed on the passenger list as the relative who would meet him. Joseph stayed with the Thumann’s until he could find work and rent a house, and he is enumerated with them on the 1900 Census. Next to arrive was 16-year-old half-brother, Julius Goetz, in September 1902. He is recorded as a locksmith from Regensburg going to his brother-in-law Max Thumann. Julius also lived with the Thumann’s until he found work in a factory and a place to live. He later returns to live with them after his 1919 marriage for a brief time. In 1904, Ignatz Bergmeister arrives in New York City in June. His passage was also paid for by Max, and the list annotates that he was “met by sister at the landing”. It is not certain if Ignatz lived in Philadelphia for a time or if he stayed in New York City. He marries in New York in 1907 and is living there in 1910, but since Hilaire met him in New York it is possible that he also came to stay with the Thumann’s in Philadelphia for a short time. The last brother, Herman Goetz, came to America in 1911 (after the death of their mother) at the age of 26. His passenger arrival record lists his brother Julius as his next of kin in America, but he lived with the Thumann’s for several years, including at the time of his marriage in 1913. The Thumann’s were definitely involved with Joseph Bergmeister’s family. Joseph’s first son and first American-born child was also named Joseph, born in 1902. For his baptism, Uncle Max and Aunt Laura were his godparents. In 1905, Max was born, and the couple was once again godparents. In 1907, Julius had Aunt Laura as his godmother and his namesake Uncle Julius as his godfather. Two babies died shortly after birth in 1909 and 1911, including a daughter named Laura after her aunt. Joseph’s youngest child was Margaret, my grandmother, born in 1913. Aunt Laura again takes her place as godmother, and her godfather was Uncle Herman which explains Margaret’s unusual middle name, Hermina. Laura was also involved as an aunt with her brother Ignatz’s children even though they lived farther away in Elizabeth, NJ. Ten-year-old niece Teresa wrote to her aunt in 1919 thanking her for the “beautiful things” she sent. When my grandmother died, I found a “calling card” of Laura’s which tells me she was a sociable woman with a lot of friends. In addition to the wonderful autograph book, my cousin gave me Laura’s scrapbook containing a lot of postcards from family and friends (an entire series of cards from her husband’s friend Ferdinand is featured in an ongoing series of posts here). Some of the postcards were from her brother Herman before he immigrated, at least one is from the previously unknown sister Elsa, and some appear to be from a niece that is either the daughter of Elsa or a niece of husband Max. All of these things point out to me that Laura cared about friends and family and made the effort to keep in touch. Many of the cards thank her for either a letter, card, or package that she sent them. Fortunately for Laura, her youngest brother Julius lived a long life so she was able to keep the family connection to him as well as her nieces and nephews for the rest of her life. Max Thuman died on 26 November 1941 at the age of 84 from pneumonia. Laura only lived for another fourteen months, dying on 6 February 1943 from cancer. She was 73 years old. They are buried together at Mount Moriah Cemetery, which is located just across the street from their home on Kingsessing Avenue. On the surface, what would I possibly find in common with this woman? I didn’t leave home at a young age to move to a new country. Nor did I marry. I’m probably not as outgoing as Laura seems to be (at least until you get to know me or vice versa). But there is something about her that makes me feel a kinship. Even though she didn’t travel (that I know of) once she moved here, Laura’s trip to this country reminds me of my own love of travel. I didn’t get married (yet) like she did, but I’ve dated older men with an age difference like she had with Max. I try to keep relationships with friends and family over distance. I have a collection of postcards from friends and family. And the most significant commonality – I love my nieces and nephews as she did hers. The theme this week asks “Which ancestor do you love to research? Which ancestor do you feel especially close to? Which ancestor seemed to have a lot of love?” I love researching Laura because she continues to surprise me with facts about her and her family that I didn’t know. I feel especially close to her – she had no direct descendants and neither do I, so if I don’t remember her amazing life, who will? Finally, she seemed to have a lot of love for her family and friends. I hope that I can be as fun-loving, caring, and thoughtful as she was! Siblings: Maria (1871-1871), Joseph Bergmeister (1873-1927), Ignatz Bergmeister (1876-1919), Herman Goetz (1885-1918), Julius Goetz (1886-1971), Elsa ? 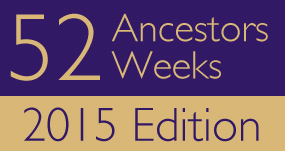 The theme for Week 6 of the 2015 edition of the “52 Ancestors in 52 Weeks” challenge is “So Far Away”. This theme asked “Which ancestor is farthest away from you either in distance or time/generations?” My answer would have to be my 14th great-grandfather, Six Welshofer. I found it quite appropriate that a man with the first name of Six would be fit the theme for Week 6! At sixteen generations back, he is definitely the ancestor who is farthest away from me. I find the concept of sixteen generations mind-blowing since my goal when I started researching my family history was to discover where my eight great-grandparents were born in Europe. This is the part of the weekly post where I regale my readers with the story of my ancestor’s life and explain why I chose them for this week’s theme. However, I have one problem in telling Six’s story – there aren’t enough facts to fashion a life story. I am not even certain of his birth or death dates. What is known, however, based on the house histories for the town of Armetshofen in Bavaria, is that a man named Six Welshofer, a farmer, existed and lived in the town. He is assumed to have been born approximately in 1487 based on when he appears in the town’s history. I don’t have evidence of his death date, but the name of his son and the next several generations were recorded in the house-owner history of the town. Area of Bavaria of the line of descent from Six Welshofer – gray line is distance from Armetshofen to Viehhausen, the move of Six’s great-great grandson Johann. Men usually lived and died in the town of their birth – but they did move, and when they did it was usually for their profession or if they were not the eldest son inheriting the land from their father. Women generally moved from the town of their birth to a nearby town in order to marry someone. After marriage, they would have a lot of children (by today’s standards)! When either spouse died young, they remarried – quickly! In my ancestral line back to Six, it was his great-great grandson Johann Welshofer that apparently moved from the ancestral town of Armetshofen. He moved to Viehhausen, about 85 miles northwest of his birthplace, and got married there. My line after Johann switches to six generations of females, and all but one move to a different town to get married (and live the rest of their lives there). Only Johann’s great-granddaughter marries and dies in the town of her birth (Breitenau). Her story illustrates several of my generalizations listed above. She gave birth to 9 children in 10 years, but only five survived past infancy. She died at the age of 44 (leaving children aged 4, 5, 12, 14, and one who’s age is unknown). Her widower remarries seven weeks later! But her daughter from that marriage (the 5-year-old), lives to the age of 74 and outlives her own daughter. After that first move up north to Viehhausen, the family moved back down towards Dachau (Armetshofen) in the next generation. All of the town names in the following generations are all in this general area – until generation #13 when my great-great grandmother moved to Regensburg – near Viehhausen. The biggest move of all comes from her son, my immigrant to Philadelphia. It’s certainly hard to fathom sixteen generations. And humbling to realize that someone who lived and died so long ago made it somehow possibly for my own life in my time and place five hundred years later. The theme for Week 5 of the 2015 edition of the “52 Ancestors in 52 Weeks” challenge is “Plowing Through” and my ancestor is my great-grandfather, Joseph Bergmeister. One might assume he was a farmer since the theme is “plowing through” but he was a baker. He did, however, have to plow through one particularly tragic year in his life. Josef (Joseph) Bergmeister was born on 12 February 1873 in Vohburg a.d. Donau, Bavaria, Germany to Joseph Bergmeister and Ursula Dallmaier. His father was a flour merchant, and based on the fact that the children were born in different towns throughout Bavaria (Asbach, Vohburg, Abensberg) I assume that he was a traveling merchant. Joseph had a big sister, Hilarie (called Hilaury, Lari, or Laura for short) who was three years older. Another sister was born in between but she did not survive. Joseph became the middle child when his brother Ignatz was born in 1876. At some point during Joseph’s childhood, his father died. I have yet to find out when, but it was sometime after the youngest son’s birth 1876 and 1884, because in May of 1885 his widow is remarried and having another child. I know that the family – with or without their father Joseph – was settled in the city of Regensburg by 1879. By 1884, Joseph’s mother Ursula is married to Herman Goetz (Götz). The Bergmeister siblings gained half-brothers Herman in 1885 and Julius in 1886 as well as a half-sister Elsa (birth date not yet known). 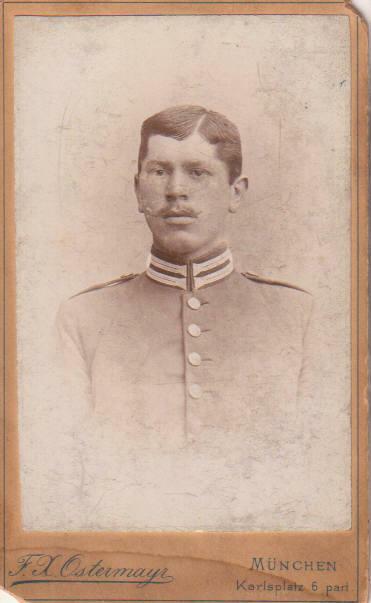 From 1893-95, Joseph served in the Bavarian Leib Regiment, or the Königlich Bayerisches Infanterie Leib Regiment. They were headquartered in Munich at that time. By 1897, Joseph is in the town of Pfaffenhofen an der Ilm. It’s just an assumption, but given that his uncle lived there I presume he went there to work for his uncle. Uncle Castulus Bergmeister owned the bakery in Pfafenhofen (still in operation and run by my Bergmeister cousins) and Joseph was also a baker. In Pfaffenhofen, he met and married Maria Echerer, the daughter of a bricklayer whose family had been shoemakers in Pfaffenhofen for centuries. The couple married on November 2, 1897…just in time, for the following February – in fact on Maria’s 23rd birthday – they had their first child, a girl named Maria after her mother. In May 1900, Joseph left Pfaffenhofen for Antwerp, Belgium where he boarded a steamship for the United States. His big sister Lari had immigrated in 1893. By 1900, she had married another German immigrant named Max Thumann. When Joseph arrived at the port of Philadelphia, Lari was there to meet him. Joseph lived with the Thumann’s for a while, but by the following year he had moved to a home of his own. In June 1901, his wife and 3-year-old daughter arrived in the U.S.
Joseph’s family started to grow considerably after that. Just nine months and two weeks after the happy couple reunited, they welcomed a son, Joseph. Two more sons followed: Max in 1905 and Julius in 1907. During these years Joseph’s family enlarged in another way as well – his brother Julius arrived in the U.S. in 1902 and Ignatz in 1904. Unfortunately, Joseph and Maria lost two children who were born premature: a son, Charles, in 1909, and a daughter, Laura, in 1911. Earlier in 1911, Joseph’s mother died in Regensburg, and afterwards his brother Herman immigrated to Philadelphia. One final child was born to Joseph and Marie – a daughter, Margaret, in 1913 – my grandmother! Despite the 15-year age gap between the oldest and youngest (and the 5-year age gap between the second youngest and my grandmother), the five siblings were close. So far I’ve mentioned a few sad events in Joseph’s life such as losing his father when he was a boy and the deaths of two infant children. In addition, the year after Margaret was born, Joseph’s sister-in-law – the wife of brother Herman – died during childbirth due to a ruptured uterus. However, these tragedies are not why I chose Joseph’s story for the theme of “plowing through”. I realized that during one particular time period – from October, 1918 through November, 1919 – he had to plow through and struggle through some very sad events. First, on 11 October 1918, Herman Goetz died of pneumonia at the age of 32. At the time, brother Julius was serving in the U.S. Army and his siblings were likely concerned about his welfare since the world was at war (he survived unscathed and died many, many years later at the age of 84). Then, not quite four months later, on 05 February 1919, Joseph’s wife Maria died from heart disease. She was just weeks weeks away from her 44th birthday. Joseph and Maria’s oldest daughter was weeks away from turning 21 years old. Their sons were 16, 14, and 11, and my grandmother was not quite 6 years old. The final event in the tragic year was the death of Joseph’s brother Ignatz. He died on 19 November 1919 at the age of 43 leaving behind a wife, an 11-year-old daughter, and a 10-year-old son. Joseph had a very difficult time after his wife died, and according to his children he did not take good care of himself. He passed away from nephritis on 30 May 1927 at the age of 54. At the time of his death, he had three granddaughters, Marie (age 7) and Mabel (age 3) from his oldest daughter and Helen (age 1) from his oldest son. He would eventually have a total of 14 grandchildren (as well as 30 great-grandchildren, 48 great-great grandchildren, and…I lost count of how many in the youngest generation at the moment!). I wish I knew more about Joseph, and my grandmother wished she knew him a little longer. But I’m glad he had the strength and grace to plow through his struggles. He leaves a legacy of “plowing through” whatever life throws at you to inspire his numerous descendants. Siblings: Hilarie Bergmeister Thumann (1870-1943), Maria (1871-1871), Ignatz Bergmeister (1876-1919), Herman Goetz (1885-1918), Julius Goetz (1886-1971), Elsa ? Update: One Death Date Found, One to Go! On January 12, 2009, I wrote a post entitled Research Plan: Finding Death Dates for Joseph Bergmeister and Ursula Goetz, my great-great-grandparents. I knew their birth dates, but hadn’t yet found their death dates. I could go backwards several generations on Joseph’s side to include birth, marriage, and death dates, but I was still perplexed as to when he died. So, I developed a solid plan based on what I knew. Plans are great, but in order for them to work you actually have to put it into action. I didn’t. However, luck was on my side…without trying, I found the death date of Ursula! Ursula Dallmeier was born in Aichach on 17 Mar 1847, the daughter of innkeeper Joseph Dallmeier from Aichach and Ursula née Eulinger. 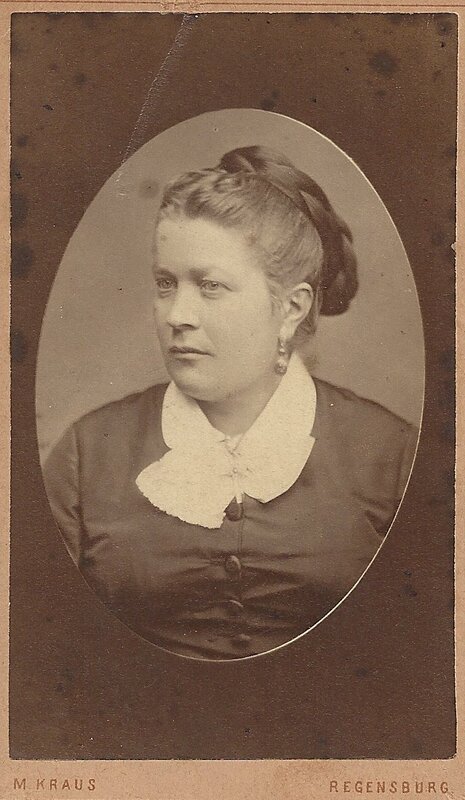 Ursula Dallmeier was born in Prittlbach on 21 Sep 1846, the daughter of innkeeper Joseph Dallmeier (or Dallmayr) of Asbach and Ursula née Eichinger. Based on the dates of the births of her children, I made some assumptions on the death date of Ursula Dallmeier Bergmeister Goetz. Based on the fact that she was alive at the time of her son Joseph Bergmeister’s marriage and she was not by the time of her younger son Julius Goetz’s marriage, I assumed she died between 1897 and 1919. The place was assumed to be Regensburg. As I said, I never actually put the research plan into action, but I continued to research the family by tracking down some cousins. When I found her son Julius’ grandson, he shared a treasure trove of documents and photos with me. 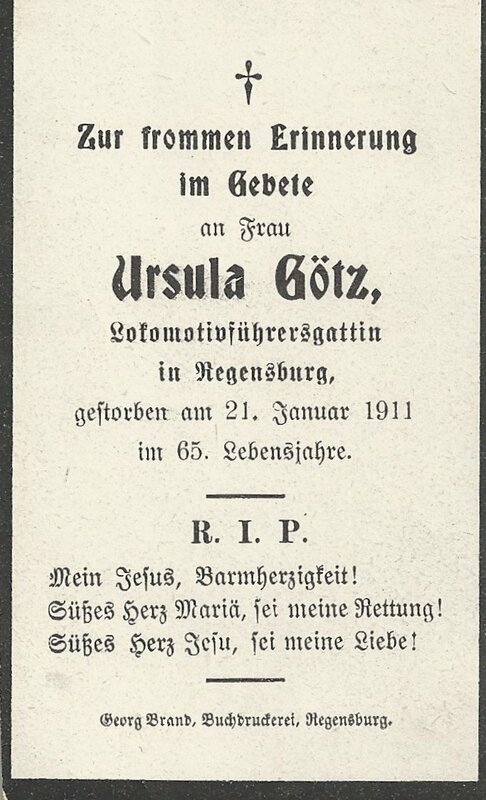 Among the pile were some funeral cards…and suddenly, I knew when Ursula died – 21 January 1911. What Happened to Uncle Herman? In my quest to prepare for the 1940 Census by documenting all of my relatives and their potential 1940 addresses, I realized there was a relative or two I never found in earlier censuses. One such relative was my great-grandfather’s half brother, Herman Goetz. Herman and his brother, Julius Goetz, left a rather good paper trail except I was never able to locate Herman – with certainty – in either the 1920 or 1930 Census. The name “Herman Goetz” was not exactly “John Smith” but it was a common name among German immigrants, and I never really tried to determine if any of the Herman’s I found was “my” Uncle Herman. Did he move out of state? Did he return to Germany? In genealogy, as in life, sometimes the simplest answer is the correct one. I couldn’t find Herman in the 1920 Census because he died. It’s almost comical that I never considered that possibility until I discovered it, quite by accident, in one of Ancestry’s newer databases: Pennsylvania, Church and Town Records, 1708-1985. There does not appear to be a complete list of what records are included in this collection, but in my searching of various surnames I’ve found some hits in funeral home records and some Catholic cemetery records. I found Herman in the Record Books for the John Kimmerle Funeral Homes. He died on 11 October 1918 from pneumonia and was buried at Mt. Moriah Cemetery on 18 October. His sister, Hilaury “Laura” Bergmeister Thuman, paid for the burial. His death in 1918 finally answers the question of why my father never heard of him – my grandmother barely knew him since she was only 5 years old when he died. Portion of the 1897 marriage record that details the status of Joseph Bergmeister's parents. 22 Apr 1911 – Herman sets sail from Antwerp aboard the S.S. Finland. He is listed as Herman Götz, a 26-year-old locksmith from Regensburg whose father, also named Herman Götz, lives in Regensburg. 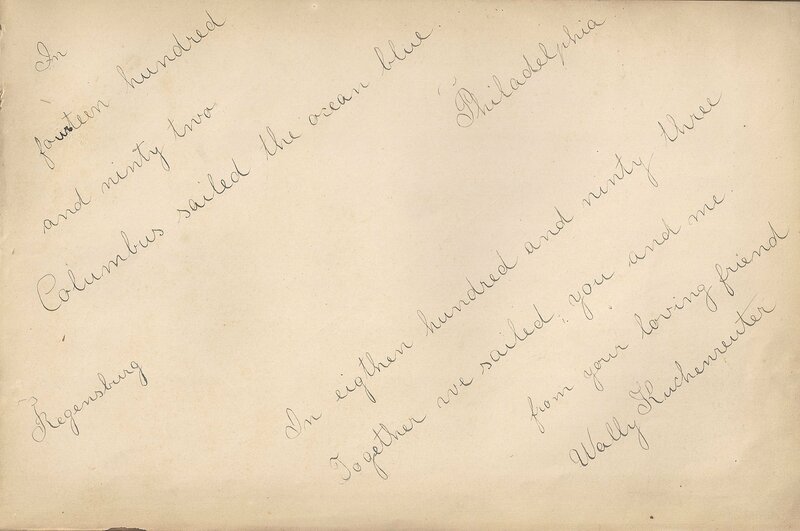 He is traveling to his brother, Julius Götz, who is living at 500 Lehigh Avenue in Philadelphia, PA. On 03 May 1911, Herman’s ship arrives in New York City. 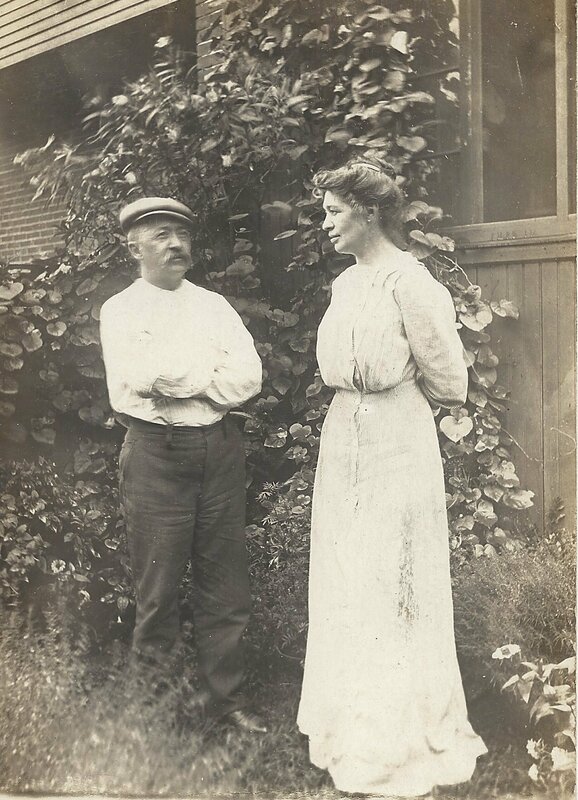 24 Mar 1913 – Herman receives a marriage license to marry Florentina Bottner. He is living at 6078 Kingsessing Street (the address of his half sister, Hilaury Bergmeister Thuman, and her husband, Max) and was born on 14 May 1885 in Germany. Florentina lived at 3458 Amber Street and was born on 14 Aug 1877 in Germany. Parents’ names were not requested on the license, and neither had been married before. 11 Apr 1913 – My grandmother, Margaret Hermina Bergmeister, is born and apparently named after her Uncle Herman. She is baptized on 13 July 1913 and her godparents are Uncle Herman Goetz and Aunt Laura Bergmeister Thuman. 12 Aug 1914 – Herman’s wife dies. Her death certificate lists her name as Mrs. Flora Goetz with the same birth date as the marriage license above. Although she is listed as married, the information is provided by her mother and the address given is that of her mother’s and the same as provided in her marriage license. She died from peritonitis “due to ruptured uterus during child birth”. 12 Sep 1918 – Herman registers for the draft. His draft card shows he is living with his sister and brother-in-law at 6078 Kingsessing Street and Laura is listed as his nearest relative. He was born on 14 May 1885. He is naturalized, although I have not yet found his papers. He is employed as a machinist at Standard Roller Bearing Co. at 49th and Merion. His physical description: tall, stout, grey eyes, red hair. Front of Herman Goetz's WWI Draft Registration Card. 11 Oct 1918 – Herman died from pneumonia based on information found in the funeral home records. His address is the Thumans’ address on Kingsessing Street, which is directly across the street from the cemetery in which his is buried on 14 Oct 1918, Mt. Moriah Cemetery. What little I do know of “Uncle Herman” is sad – although he quickly found love in his new country, his wife died in childbirth the following year and he died only four years later at the age of 32. It is also the beginning of a very sad chain of events for my great-grandfather, Joseph Bergmeister. First, in October, 1918, his half-brother Herman dies. Less than six months later, in February, 1919, his wife Maria dies at the age of 43, which leaves him as the single parent of five children. Later that year, in November, his brother Ignaz Bergmeister dies at the age of 43. Joseph would only live to 54 himself, dying in 1927. Of the Bergmeister and Goetz siblings, despite the young deaths of Herman Goetz and Joseph and Ignaz Bergmeister, their sister Laura Thuman lived to 73 and Julius Goetz lived to 84. There was a 16-year age difference between Hilaury and Julius, however, so Julius was the sole surviving sibling for many years after Laura’s death in 1943. Although my grandmother never knew her “namesake” Uncle Herman, I assume she had some familial relationship with Uncle Julius. Although my father knew who he was, he didn’t recall meeting him and their lives overlapped by quite a bit – Julius did not die until 1971. I’m not sure what (V 135) refers to, but there is enough identifying information to know that this is my great-grandfather’s brother Ignaz. 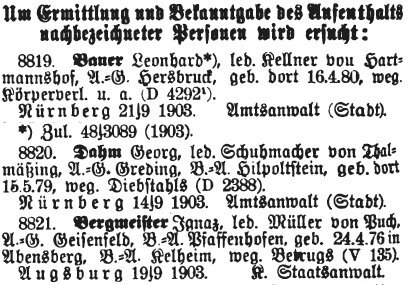 The Bergmeister’s were millers from Puch, and I knew Ignaz’s birthdate from a later record in his own handwriting. However, his birthplace of Abensberg is new information for me. Apparently Ignaz was not “found” by the police or the court. In the 23 October 1903 issue No. 144, an arrest warrant (Haftbefehle) is issued. That listing says he is wanted for fraud by the State Advocate by order of the judge in Burgau and should be delivered to the nearest jail. I would love to know what constituted “fraud” in Bavaria in 1903, but unfortunately I have no details on what led up to the warrant for his arrest. I am doubtful, however, that Ignaz ever made it to jail, because the following June he boards the S.S. Switzerland in Antwerp, Belgium and arrives in Philadelphia, Pennsylvania in the United States on June 16, 1904. This passenger arrival record is how I discovered that Joseph Bergmeister and his sister Hilaury even had a brother – before that discovery, Ignaz was unknown to me. I knew he was their brother because the passenger arrival record listed Hilaury’s husband, Max Thuman, as the brother-in-law that paid for his passage, and the page indicated that his sister met him at the dock. Further research into Ignaz’s life proved the relationship. The 1907 marriage record in New York City of Ig. N. Bergmeister and Therese Frank lists Ignaz’s parents as Joseph Bergmeister and Ursula nee Dahlmeier – Joseph’s and Hilaury’s parents. I was curious that my grandmother, who was Ignaz’s niece, never mentioned him although she mentioned her aunt “Laura” and another uncle, Julius Goetz (after the death of her Bergmeister husband, Ursula Dahlmeier (or Dallmeier or Dallmaier) Bergmeister married Herman Goetz and had at least two more children, Herman and Julius). After researching more about Ignaz, I found out why she never mentioned him – she probably never knew him. In 1908, the couple had a daughter, Theresa. A son, Charles N. Bergmeister, was born in November, 1909. In 1910 the family lived in New York City on E. 57th Street where Ignaz worked as a driver at a brewery. 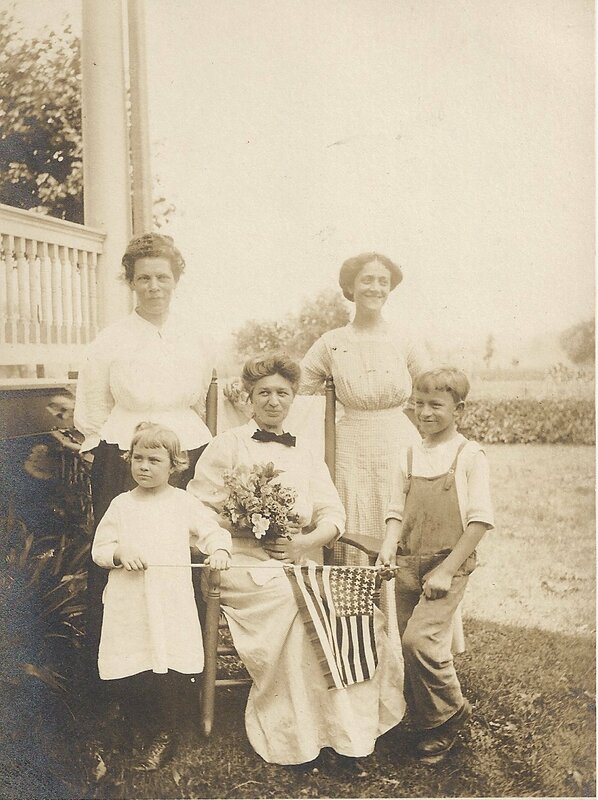 Between 1910 and 1918, the family moved to Elizabeth, NJ, where wife Theresa had lived at the time of the marriage. The family lived at 638 Fulton Street. 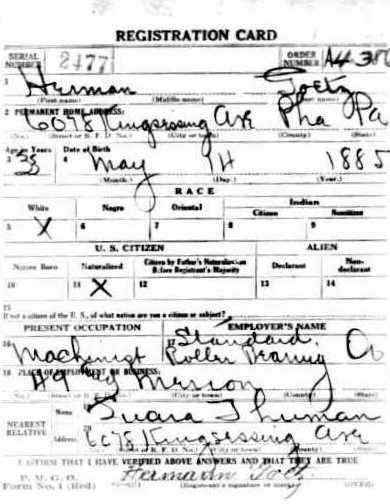 Ignaz registered for the WWI draft listing his birth date as 23 April 1876 (one day off from the 1903 arrest warrant notice) and his occupation as a driver for Rising Sun Brewery in Elizabeth, NJ. The physical description on the draft card indicates he was tall with a medium build, had blue eyes and “mixed” hair color. Unfortunately, the next public record found for Ignaz is his death record. He died on 19 November 1919 from cirrhosis of the liver. He was only 43 years old; his children were only 9 and 11. Ignaz’s widow and children are still living in the same house for the 1920 and 1930 census enumerations. At the time of Ignaz’s death, my grandmother was only 6 years old. Her mother died earlier that year. Her father, Ignaz’s brother Joseph, would also die young in 1927. Because of the distance from Elizabeth to Philadelphia, I assume that my grandmother and her older siblings did not know their cousins Theresa and Charles. In trying to track down Ignaz’s descendants, I have not been able to find any further information on his daughter, Theresa Bergmeister. Ignaz’s son, Charles Bergmeister, married Florence Obach and had at least two children. Their son, Steven Charles, was born in 1943 and died in 1994. One year later on the same date as Steven’s death, Charles died at the age of 86. Relatives of Florence have indicated that the couple also had a daughter named Jeanne (possibly Jeanne Gelber) who is still living. 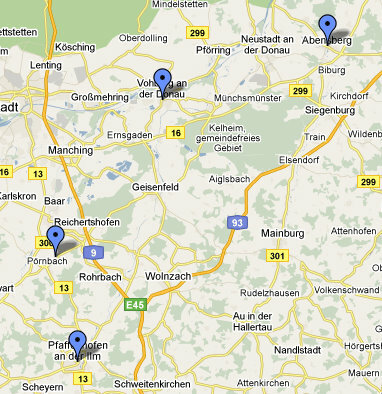 Locations for Joseph Bergmeister's birth, marriage, and children in Bavaria (Oberbayern). Now I know about the rest of the short life of Ignaz Bergmeister, but I wish I knew more about his early life and the events that led up to being wanted for fraud. The police listing gave me an important clue with the name of his birthplace: Abensberg. Both Joseph and Hilaury were born in Vohburg. The parents, Joseph and Ursula, were married in Pfaffenhofen although Joseph was from Puch. As a flour merchant, it appears that Joseph traveled around Bavaria quite a bit. I am still searching for his death record. Based on the birth dates for Ursula’s other children, it is assumed that Joseph (senior) died between 1876 and 1884 somewhere in Bavaria. Of course, the story of Ignaz also raises another question – how many of Bavaria’s Most Wanted show up on passenger arrival records to the United States shortly after they make the list? Now that would be an interesting research project! A future post will offer some tips on using Google Books to find and use records such as the Bayer[ische] Zentral-Polizei-Blatt. Source: Bayer[isches] Central-Polizei-Blatt. Published 1903. Original from Harvard University, digitized August 5, 2008. Accessed via Google Books: http://books.google.com/books?id=4cAqAAAAYAAJ. Source information for marriage record, death records, census records, and draft record available upon request. Miriam recently challenged genea-bloggers to write about their brickwall ancestors. In my case, I don’t have brickwalls so much as avenues of research I have not yet pursued. One of my goals for 2009 was to find some missing details in my Bavarian ancestors. In the case of my great-grandfather, Joseph Bergmeister, I can document his ancestry back to the 1600’s, and I’m still going backward once I find time to get back to the family history library. I was fortunate that the church records exist for the towns of Puch, Pfaffenhofen an der Ilm, and surrounding towns. But, my research is far from complete – even though I can provide death dates for Joseph’s paternal grandparents, great-grandparents, and even his 2nd great-grandparents, I have no idea when his parents died. But, I do have some clues from my research. Here I present my research plan and ask readers to examine my evidence, logic, and path forward, and offer a critique or advice to set me on the right path. On the marriage record for Julius in 1919, the license lists the “residence of father” as “Germany” and “residence of mother” as “dead”. [Source: Clerk of Orphans’ Court, Philadelphia, Marriage License #1919-415062.] The marriage license for Herman in 1913 is a different format and does not ask about parents. Based on the above facts, I can make reasonable assumptions about the approximate time and place of the deaths of Joseph Bergmeister and Ursula Goetz. Estimated years: 1876 – 1884 – based on the birth of his youngest identified son, Ignaz, and his wife’s first child in her re-marriage. Estimated place: Munich – based on his son Joseph’s marriage record. Estimated years: 1897 – 1919 – based on the fact that she was still alive at the time of son Joseph’s marriage and she was not by the time of Julius’. It is noted, however, that Julius immigrated in 1902 at the age of 16 – perhaps she died in that year. 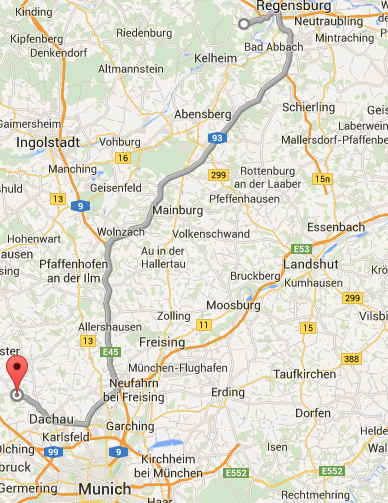 Estimated place: Regensburg – based on her residence at the time of Joseph’s marriage and her Goetz sons’ birthplace. Next step – where do I search for these death records? Unfortunately, the FHL does not have church records on microfilm for such large cities as München (Munich) or Regensburg. In each instance, I would have to write to either the civil or the episcopal archive. I am not sure if the lack of a date will be problematic – the ranges are too broad. Although I have written to the archives in the past to get some of this information, it has been so long that I am not even sure which office to write to, or if they can perform such a search without a more specific date. I could either make an attempt with a letter, or I can find a researcher in Bavaria to investigate further. Census records – After Germany was united in 1871, a census was conducted every five years between 1880 and 1910. I am not sure where to obtain this information. City directories – Both Munich and Regensburg are large cities. If city directories exist, they may help pinpoint not only the year of death (especially for Joseph), but also a potential parish to find a church record. Marriage record of Ursula Bergmeister and Herman Goetz – it is possible that the record of Ursula’s second marriage may reveal more about her husband Joseph’s death. Any comments on my research to date, the assumptions, or where to go next will be greatly appreciated. The following is a map that outlines the German locations noted above. Detailed map of Bavaria showing all locations from Regensburg in the northeast to Munich in the south which are mentioned in the records for the lives of Joseph Bergmeister and Ursula Goetz. Where are their final resting places?